The winter of 1942 saw Russia defending Stalingrad from German capture. These German tanks aided in the battle, which ultimately left the city in ruins. Three days after Congress declared war on Japan, Germany responded by declaring war on the United States. Japan had an advance pledge of support from Hitler in the event of war with the United States. Now President Roosevelt faced a two-ocean war — a true world war. Despite widespread cries for revenge against Japan, the first major decision made by the President was to concentrate on Germany first. The American Pacific Fleet would do its best to contain Japanese expansion, while emphasis was placed on confronting Hitler's troops. 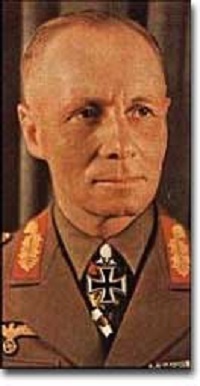 The vast military knowledge of German Field Marshal Erwin Rommel — known as "The Desert Fox" — was not enough to keep British and American forces from driving German troops from North Africa in late 1942. Roosevelt believed that a Nazi-dominated Europe would be far more impregnable that any defenses Japan could build in the Pacific. American scientists worried that, with enough time, German scientists might develop weapons of mass destruction. Once Hitler was defeated, the combined Allied forces would concentrate on smashing Japanese ambitions. American military leaders favored a far more aggressive approach to attacking Germany than their British counterparts. A cross-channel invasion of France from Britain would strike at the heart of Nazi strength, but the British command was dubious. Winston Churchill feared that should such an operation fail, the loss of human life, military resources, and British morale could be fatal. Instead, Roosevelt and Churchill agreed to implement an immediate blockade of supplies to Germany and to begin bombing German cities and munitions centers. 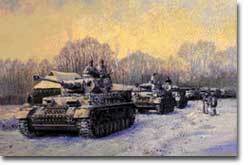 The army would attack Hitler's troops at their weakest points first and slowly advance toward German soil. The plan was known as "closing the ring." In December 1941, Roosevelt and Churchill agreed to attack German holdings in North Africa first. That maneuver was finally executed in October 1942. Nazi troops were occupying much of the African Mediterranean coast, which had been controlled by France prior to the war. Led by British General Bernard Montgomery, British forces struck at German and Italian troops commanded by the "Desert Fox," German Field Marshal Erwin Rommel, at El Alamein in Egypt. As the British forced a German retreat, Anglo-American forces landed on the west coast of Africa on November 8 to stage a simultaneous assault. Rommel fought gamely, but numbers and positioning soon forced a German surrender. The Allies had achieved their first important joint victory. Simultaneously, the Soviets turned the tide against Nazi advances into the Soviet Union by defeating the German forces at Stalingrad. When springtime came in 1943, the Allies had indeed begun to close the ring. The first American air attack on European enemies came in August 1942. 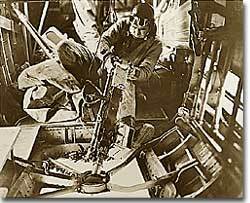 Here, a U.S. Air Force gunner uses a machine gun to fire at German planes. Once Northern Africa was secured, the Allies took the next step toward Germany by launching invasions of Sicily and Italy. American and British leaders believed that when the Italian people faced occupation of their homeland, they would rise up and overthrow Mussolini. Fearing that the Allies would have a free road up to the border of Austria, German forces began to entrench themselves in Italy. Despite German presence in Italy, Mussolini was arrested and the Italians surrendered to the Allies on September 3. There was no free road to Austria, however. German forces defended the peninsula ferociously, and even when the European war ended in May 1945, the Allies had failed to capture much of Italy. A thorough look at the North African Campaign of World War II which pitted British General Montgomery against German General Rommel, the "Desert Fox." Read about the commanders and their tactics, weapons and supplies, and browse the many images posted throughout the website. Much information is not accessible from the table of contents, so follow those inline links. The Russian strategy at the Battle of Stalingrad was to trap the German army in an egg-shaped line of defense 30 miles wide and 20 miles deep. Too good for their own good. A Ukranian soccer team, challenged by German occupying forces to a "friendly" match, soon learned there was defeat in victory.